Apart from Lynda’s hat-trick, Captain Shilky Devi netted a brace while Sunita Munda scored the other. 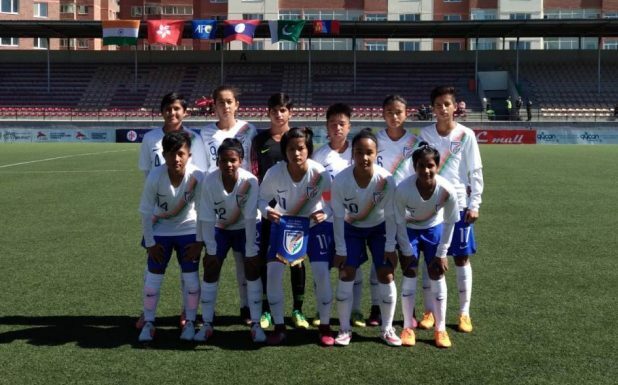 The Indian girls who won the SAFF U-15 Championship last month in Bhutan are aiming to qualify into the final phase of the AFC Women’s Championship. They next play Pakistan U-16 in their next match on September 19 and will then play hosts Mongolia U-16 and Laos U-16 in their last group league match respectively. The group toppers gain an automatic qualification into the final phase of the AFC Championship to be held next year. Head Coach Firmin D’Souza sounded ecstatic after the win. “The girls executed the game plan perfectly. The win acts as a bonus for our morale that has been high since the girls won the SAFF U-15 Championship,” he said. “We are confident ahead of our clash against Pakistan and hope to continue our winning ways,” he added. It was in fact, Sunita who opened the flood gates in the 23rd minute. In the 35th minute, Shilky Devi India’s lead while Lynda made it 3-0 as the India went into the half-time enjoying a comfortable 3-0 lead. Changing over, the girls continued their attacking momentum and were rewarded with a penalty in the 50th minute which was gleefully converted by Shilky. In the 73rd minute, Lynda Kom, taking full advantage of Aveka Sinh’s vicious cross, made it 5-0. Hong Kong reduced the margin in the 86th minute but it did not deter Lynda from completing her hat-trick in the dying minutes.